Premium Trout Fly Fishing and Trout Guiding in Nelson, South Island, New Zealand. Sighted Fly Fishing for large Brown Trout a speciality. Each DVD is a visual diary of keen fishermen fishing some of the premier trout waters of the New Zealand’s South Island over the course of a season. Enjoy watching the wary brown trout in crystal clear waters – the ultimate challenge for any avid fly fisherman – amidst spectacular scenery. These DVD’s will not only entertain but you can learn about new locations and techniques to further your own fishing in these challenging waters. Distant Emerald Water. Large Brown Trout. 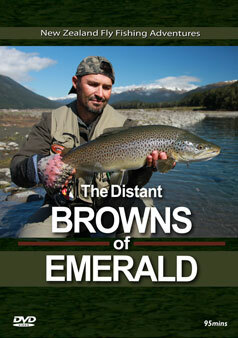 It’s often said that New Zealand leads the world in sighted fly fishing for large brown trout in gin clear water. We took a look at three magical trips where the ‘quality of the experience’ is at the highest level. It’s about putting in time and effort to find these places and eventually the stars will align with the weather, scenery and fishing at their very best.